Recently, TDmonthly Magazine interviewed several up-and-coming construction toy innovators to get the low-down on how their unique products fit into the marketplace. What follows are the highlights from that discussion. TDmonthly: What sets your product apart from the competition? Patrick M. Calello, president, Automoblox Co. (ToyShow): Our construction system permits very young children to create cool cars of their own design. The Automoblox system provides the framework for the next generation of car designers, engineers and enthusiasts. 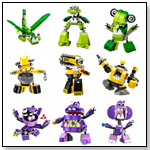 Additionally, the simple soft shapes and the rich colors of Automoblox appeal to all children (i.e., both girls and boys). Wayne Levy, president, COOLBLOX (ToyShow): Our unique interlocking design gives our toy a really good hold. The pieces don´t fall apart easily when they are moved. Kids won´t get hurt when they throw COOLBLOX at each other. David McCloskey, president, WABA Fun, LLC (ToyShow): Superstructs building sets use EVA foam in combination with plastic rods and connectors to create soft, lightweight and durable constructions. You can even put it in your dishwasher for easy cleanup. 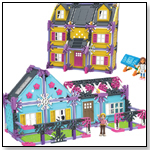 Girls find Superstructs´ colors, easy to assemble pieces, characters, and models (including a Ferris wheel and carousel in our 230-piece Super set) inviting and fun for post-construction role-play. Rock McKinley, vice president of sales and marketing, ImagAbility Inc.(ToyDirectory): The WEDGiTS on WHeeLS (WOW) set adds wheels and dual-hub mechanisms that kids must ?wedge-together? to create their rolling vehicles. The translucent colors allow the kids to see into their designs for a better understanding of the geometry and mechanics of the toy. TDmonthly: Where in the United States are your sales strongest, and to what do you credit your success in that region? Calello (Automoblox): We are targeting an affluent customer but we have not priced Automoblox out of the reach of [most] consumers. We will be focusing our sales effort in U.S. specialty, museum and gift stores in the big cities initially, especially trend-setting markets. Also, catalog and department stores, such as Neiman Marcus. Levy (COOLBLOX): Most of our sales come from on-line. McKinley (ImagAbility): Sales of the WEDGiTS line are successful in all U.S. regions. About six years ago, ImagAbility listened to key retailers? advice that a successful WEDGiTS sale was based on hands-on involvement with the customer. Since that time, ImagAbility has provided free demonstration product to every retailer. Further, these retailers advised ImagAbilty to pre-build permanently adhered WEDGiTS point-of-sale displays. These artistic WEDGiTS merchandising tools provide immediate visual capability of the toy. McCloskey (WABA Fun): In specialty retail stores where the owners better understand their products and take the time to match these with the needs of their customers. TDmonthly: What improvements will you make in your product going forward? Calello (Automoblox): We have changed vendors and retooled all of the parts to improve the function and the play experience. All blocks snap together now with consistent audible and tactile feedback. We really took a scientific approach to creating the ultimate play experience. All the plastic components that are outside the wooden body are now made of polycarbonate, an extremely rugged unbreakable plastic that can now withstand major abuse; our translucent roof is unbreakable even with a hammer. Levy (COOLBLOX): We are constantly looking at new materials and better manufacturing methods to drive down costs. McKinley (ImagAbility): ImagAbility has been presenting video-animations of its WEDGiTS characters over the past year. By the end of 2005, the first WEDGoid Adventure Animation will appear. The primary goals are consumer-brand-awareness (it will reach 12 to 20 million consumers per month via animation placements) and social-value-message (e.g., sharing, team-work and environmental care). McCloskey (WABA Fun): New connector pieces, themes and accessories to add to the post-construction role-playing fun!